Kristen Elde wrote for large-circulation health/fitness magazines for years before turning to short fiction and poetry. These days she focuses almost exclusively on poetry, with poems appearing online at The Nervous Breakdown. Her nonfiction work has run in magazines such as BUST, Health, Runner’s World, and The Writer. Kristen currently calls Brooklyn home, though her heart also splits time in Iceland and the Pacific Northwest. Didot is a contemporary of several other neoclassical typefaces all of which evoke the age of enlightenment. What could be better for a poem about the discovery of language? The reverse italic is an effect only possible with digitally generated type – it calls attention to those three words, emphasized like a traditional italic, but slightly odd because they are unfamiliar in the speaker’s mouth. 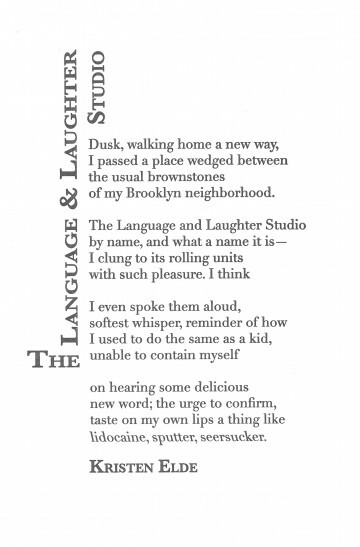 The title of a poem is (among other things) its advertisement, it’s invitation to enter, similar to the sign on the storefront described in the poem. In this case, the length of the title provided an opportunity to shape it into a kind of marquee. Baskerville is a cousin of Didot, a fellow book typeface. Small caps helped fill out the mass of the “sign” arrangement.